Maybe you're a fan of cycling who also loves dogs. Or, perhaps you are a dog lover who wants to start riding a bike. Can you put the two together and ride a bike with your dog? The latter can be a great form of exercise for certain people and dogs. For smaller dogs or exercise intolerant dogs, it's best to stick with the bike trailer or basket. Either way, it's important to do this the right way. Ride-Along or Run With the Bike? Some dogs are not meant for running. Dogs with short muzzles (such as bulldogs or pugs), senior dogs, exercise intolerant dogs, and some small dogs are just not cut out for running. They can overheat or suffer from exhaustion, illness, or injury. If you still want to take your dog along on your bike ride, you should get a bike trailer or a pet basket. Be sure to choose a trailer or basket that is large enough to give your dog some room to move around, but small enough that it won't fall out. Be sure to introduce your dog to the basket or trailer using positive reinforcement. Make sure the first few rides are slow and gentle. Also, make sure the basket or trailer is securely attached to your bike. If you decide to start letting your dog run alongside your bicycle, determine if this activity is appropriate for your dog. Canicross is another option that allows your dog to run with you, but doesn't add the risk of a bicycle. Remember that while you ride your bike, your dog will need to run the whole time. Consider the guidelines for running with your dog. Your dog should see the vet before starting any new exercise regimen. Your dog must be well-trained and socialized in order to run alongside your bike without incident. Make sure your dog can walk on a loose leash and knows how to properly behave during a walk. If you have decided that running is right for your dog, you next need to introduce your dog to the bike. Some dogs will be just fine with a moving bike while others will be scared. Be aware it may take days to weeks before your dog will walk beside you while you ride a bike. Start with your dog on a leash and a bike that is parked. If it seems afraid, walk away from the bike and reward the dog when it stops showing signs of fear. You will need to get him used to the bike, gradually moving him closer but avoiding a fearful reaction. Once your dog is comfortable with the bike, you can begin to move the bike gently. Work your way up as slowly as needed until your dog will walk leisurely beside you on a leash while you walk your bike. Reward the dog for being calm and keeping its attention on you. 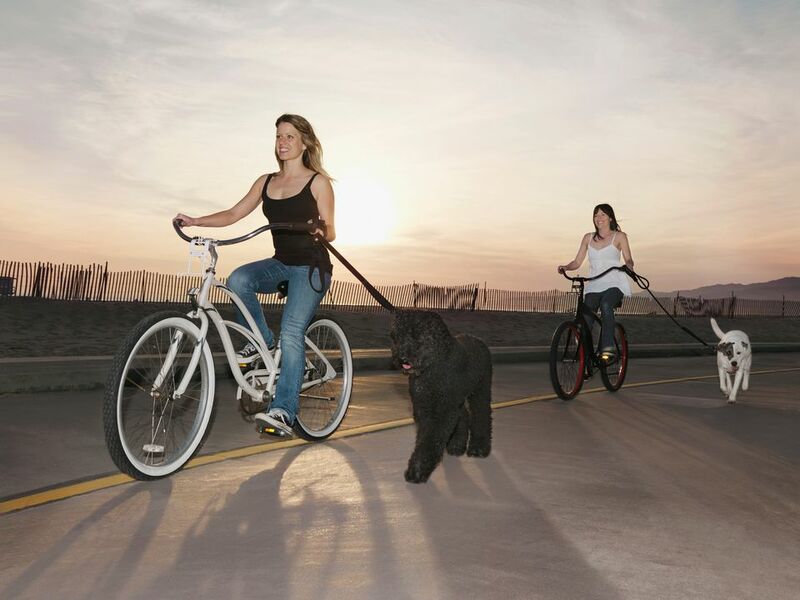 Then, start riding the bike slowly while holding your dog's leash. Begin with about 10 minutes at a slow to moderate pace. Monitor your dog's reaction to the exercise increase. Add 5 to 10 minutes to the ride every few days. If your dog is slowing down on its own or begins to limp, it's time to take a break. Rest a bit and then walk home. Increase your pace as your dog can tolerate it. Don't forget to make sure your dog has access to plenty of cool, fresh water while running. If you cannot bring water with you, run in a public area where water is available for both humans and dogs. Avoid high speeds and sharp turns. It's best on your dog if you always keep a moderate pace that allows him to trot or jog. On hot days leave your dog at home. During warmer months, consider early morning rides with your dog before the heat of the day. If your dog shows signs of heat stroke or heat exhaustion, seek immediate veterinary attention. Also, do not ride on hot asphalt with your dog. If the ground is too hot for you to touch, it's too hot for your dog's paws. When cycling with your dog, you should follow the same basic rules of walking: Pick up after your dog, have control of your dog, respect others, and pay attention. It's also important to keep your dog on a leash when running alongside your bike. Consider a bike leash to make it easier for both of you. When in doubt, go for short and slow rides until your dog builds up the endurance for more.